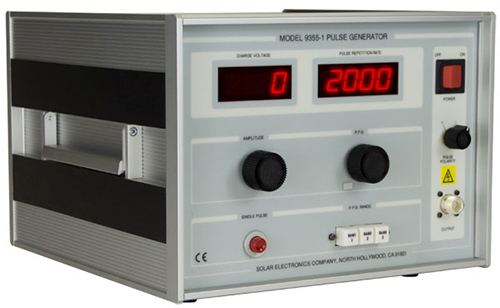 The Solar Model 9355-1 Pulse Generator is designed to provide impulse excitation by means of an injection probe placed around interconnecting cables or power wires. The unit uses a charged transmission line (50 Ω) to generate a pulse with less than 2 nS rise and fall time, and duration of approximately 35 nS, calibrated in a 50 Ω fixture to deliver up to 5 A at a rate of 30 pulse per second for one minute as required by MIL-STD-461D/E/F/G, Test Method CS115. The charged line potential of the Model 9355-1 is adjustable from less than 10 V to approximately 1900 V. The repetition rate is variable from less than 1.0 pulse per second to 120 pulse per second, or single pulses manually triggered by a panel mounted pushbutton. Digital displays monitor the charging voltage and pulse repetition rate. The Type 9410-1 high voltage 50 ohm attenuator has an insertion loss of 40 dB ± 1.5 dB from 100 Hz to 100 MHz and 40 dB ± 3 dB from 100 MHz to 1 GHz and an average wattage dissipation capability of 2 watts. The attenuator will reduce the pulse voltage by a factor of 100 to 1 (40 dB). 250 volts will be developed when 5 amperes is flowing through the 50 ohm input of the attenuator. Therefore, once the attenuation factor is applied, the voltage present at the output of the attenuator will be 2.5 volts. (250 volts – 40 dB = 2.5 volts). See your oscilloscope manual for more details on 50 ohm input.